These hooks, holders, and clips are for use with the Walker Display System. Slide them onto Plain Rods and tighten the hardened thumb screws, or hook onto Molding to hold artwork. They are all made of plated steel. Note — Please click here to contact our Product Information Department regarding questions on ordering this product or for complete components needed. Twin Clip — Grips the top edge of work up to 3/16" thick. 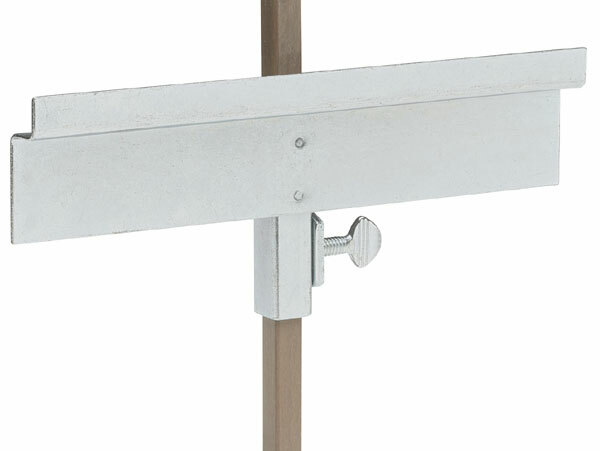 Frame Hook — Holds frames with a "lip," or stretcher. Hi-Holder — Holds hanging wire high. This hook remains hidden behind the artwork. Long Holder — Holds outside of frames, top and bottom. 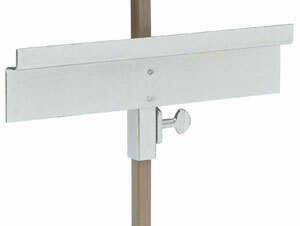 Hi-Hook — Holds sawtooth ring on plaques, certificates, and other panels. Panel (and Mat) Holder — Secure this holder over the top and bottom of panels and mats. Additional Shipping Charges Note — Additional handling charges apply to orders including Walker System components. These handling charges are calculated depending on the assortment of components ordered, and cannot be calculated prior to checkout. If you include Walker System components in your order, we will contact you with final handling charges prior to processing your order.